I have had issues with my back for several years. Due to numerous car accidents. I have been using conservative methods to relieve the pain, numbness, tingling and muscle weakness in my leg and back. Chiropractic, physical therapy and rest were my first choices. Unfortunately, those methods did not work for me. I spoke to several specialists and surgery was the best option for me to heal and continue to live the healthy and active lifestyle. 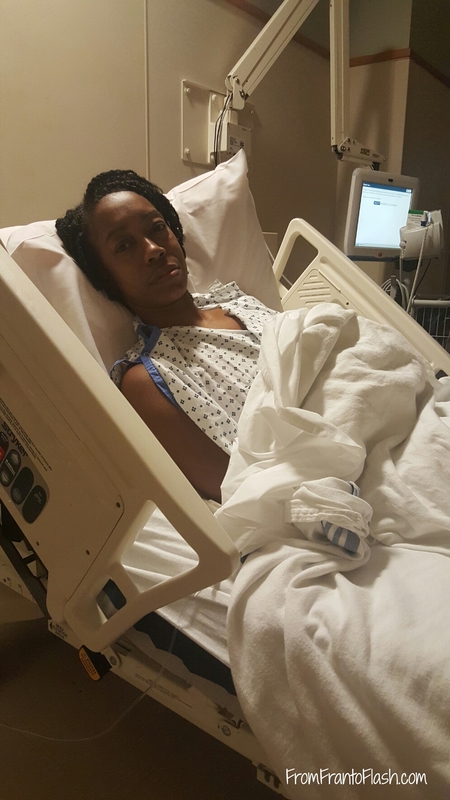 As my surgery approached, I became nervous. I was full of “what if’s” and quickly realized that I need to think positively and trust my doctor. So I did. I arrived at the hospital at 6 am for my 8 am surgery. I was nervous and anxious. I was greeted by my anesthesiologist, nurses and finally my doctor. He assured me that all would go well and I believed him. I felt at ease. I was wheeled to the operating room on a stretcher talking with the nurse along the way. It was cold in the OR and I asked for an extra blanket. The nurse said “we are going to give you a little oxygen” next thing I remember is waking up in recovery. I was nauseous. I do not handle anesthesia well. My outpatient surgery turned into an overnight stay. The nurses were amazing! They made sure I was comfortable and hydrated. 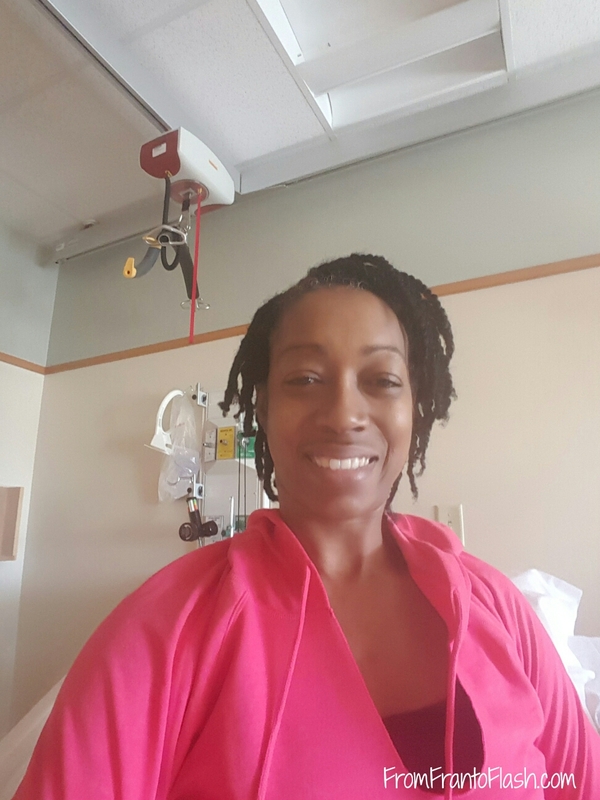 I would not be released until I was able to keep foods and liquids down without being connected to an IV. I woke up on Saturday morning determined. I was going to eat and it was going to stay down. Breakfast arrived – French toast, scrambled eggs, sausage, hot tea and orange juice. I ate slowly. I was slightly nauseous but the food stayed down. YES! One step closer to going home. The nurse said that if I kept lunch down I would be released. I read a little and showered. 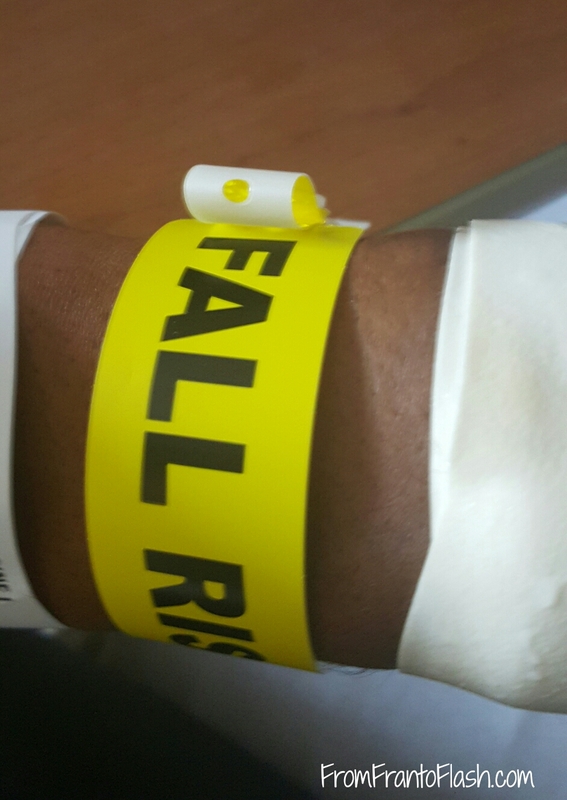 I had to sit to shower since I was considered a “Fall Risk” and I felt better. I patiently waited for lunch to arrive. Come on lunch, I want to go home!! Lunch arrived. Again, I was determined to keep it down so I could go home. 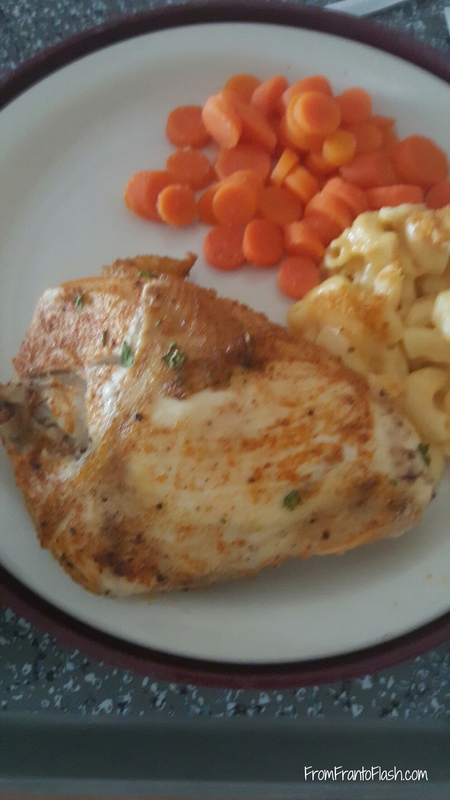 It was rosemary chicken, macaroni and cheese, and carrots with a carrot cupcake for dessert. It looked and smelled amazing! It was delicious. I ate the chicken and carrots, my son ate my mac and cheese (I am not a fan of it). It stayed down. YES! The nurse said I could go and she came in with the paperwork. I packed up and was wheeled to my sons who were patiently waiting for me to get home and continue the healing process. (I will spare you all the picture of my incision). I will be able to return to physical activity in 6 weeks. It is going to be tough but I am going to listen to the doctor so I can get back out there faster and stronger. Thanks to everyone who emailed, texted, called, tweeted, texted and came to see me. I appreciate all of you. 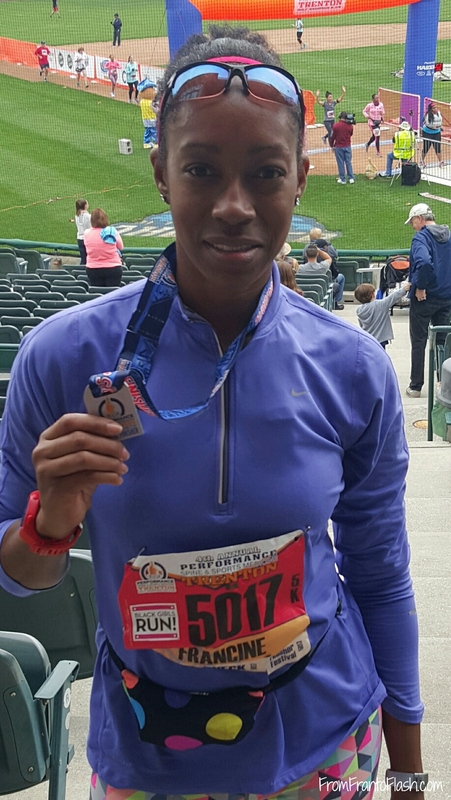 My last race of 2015, will I PR? As I embark upon my last race of the year, on November 22, Philly Half, I am seeking a PR (sub 2:00), I can’t stop thinking about how far I’ve come. My last race, Trenton Doublecross 5k, I placed 1st in my age group. I did not run much prior to this race. I took it easy as not to hurt myself before and during the race. So…I think I have it in me for the half. You see, I didn’t always love running. I did as a child but not as an adult. 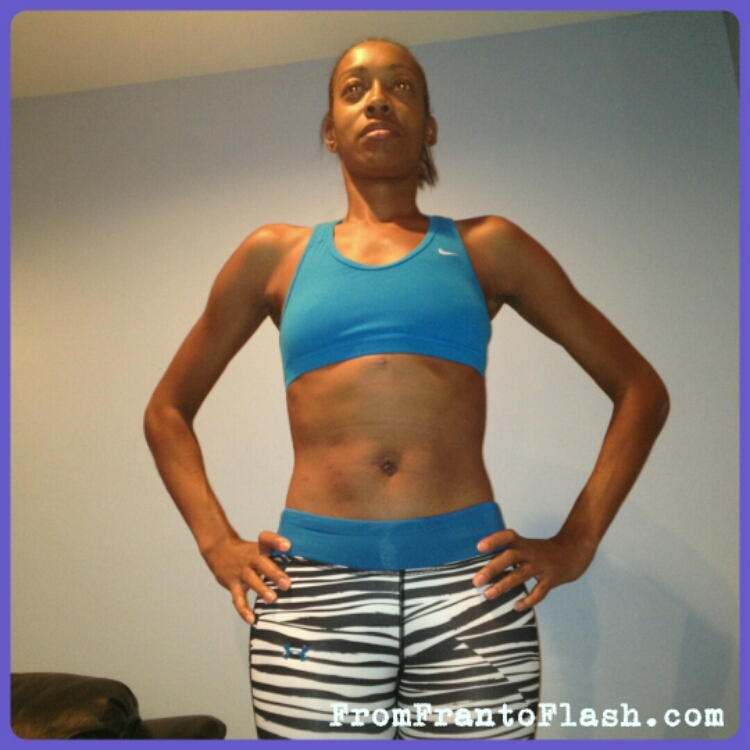 I started running seriously again 3 years ago when I ran into a member of Black Girls Run. That’s how my love of running returned. I also gained a Sisterhood. I am having surgery December 11 to help relieve the pain and pressure of my herniated discs that are pressing against my sciatic nerve. I have tried the holistic approach with no long-term relief. This is my last resort. I will be unable to run, lift or be active for 6 weeks. I am choosing to look on the bright side, I am going to get caught up on my reading and more importantly heal. Looking forward to my comeback! Wish me luck! As I look through old pictures, I see how far I have come. 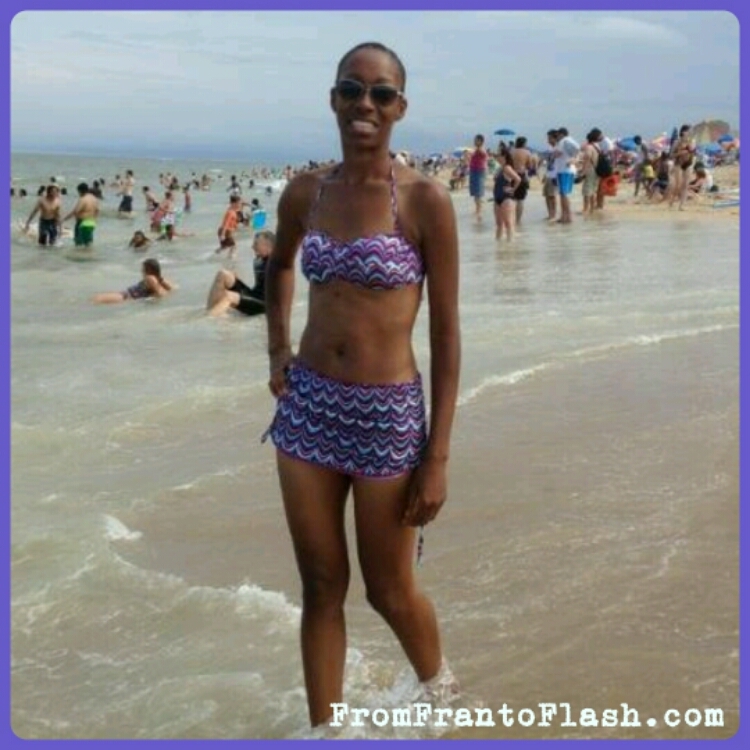 My journey is not about weight loss. My journey is about gaining weight and muscle the healthy way. I have always been thin, but I wan not always healthy. I would eat whatever I wanted and have no worries about gaining weight. I would eat junk and processed foods. I was not happy with the way I looked or felt. I knew something had to change. I hired a personal trainer who is also a nutritionist. We put a plan together and changes started happening. I felt better and stronger. I started seeing results and it made me want more. I have been going to the gym 4 times a week for strength training. I love what I see when I look in the mirror and I feel confident. A feeling a rarely felt. 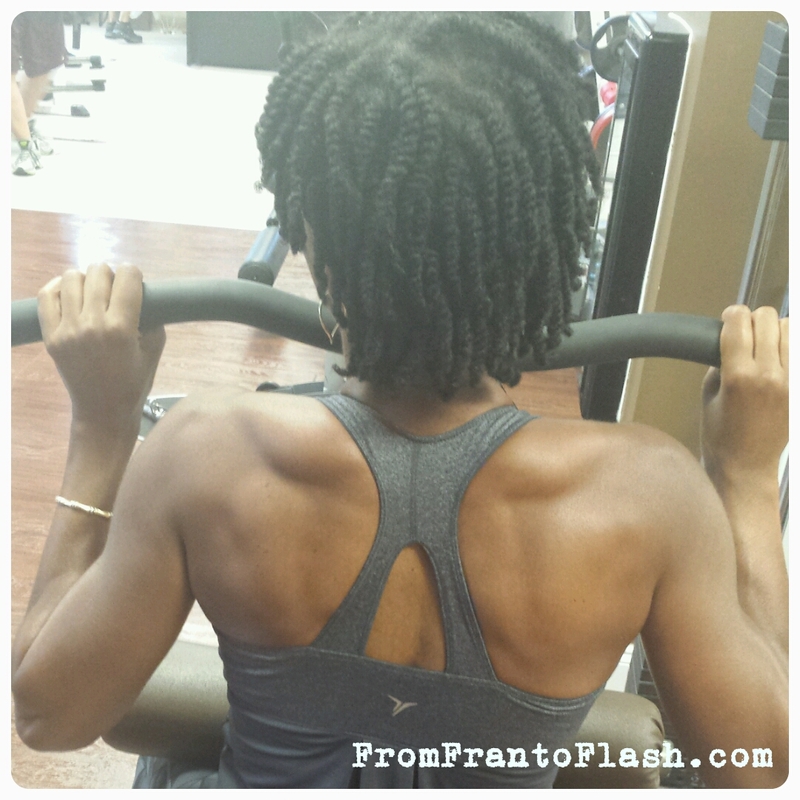 My strength training had helped me mentally and physically. I am proud of my journey and they person I am becoming. I will continue to be a work in progress, my healthy living journey will never end. What journey are you on? Are you seeing the changes you want to see? Back in Action and it feels GOOD! I have been sick and unable to run or lift for almost 2 weeks. It was horrible. I missed being active and hated being sick. I listened and followed the doctor’s orders. It was difficult but necessary. I was determined to heal. I missed 2 weeks and will miss more of marathon training but I will be able to compete in November if I continue to listen. I went to the doctor and got medical clearance to start working out and running again. My day was made, my spirits were lifted and I was starting to feel like me again. No running and strength training do not define me, but they are however an important part of my life. 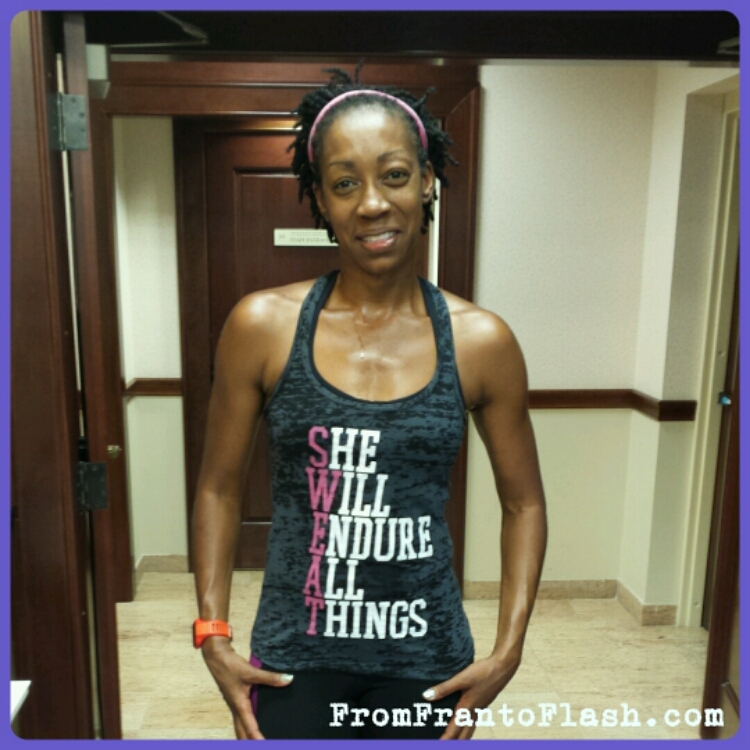 I love to run and strength train because they make me look but more importantly feel better. It is good to be back! 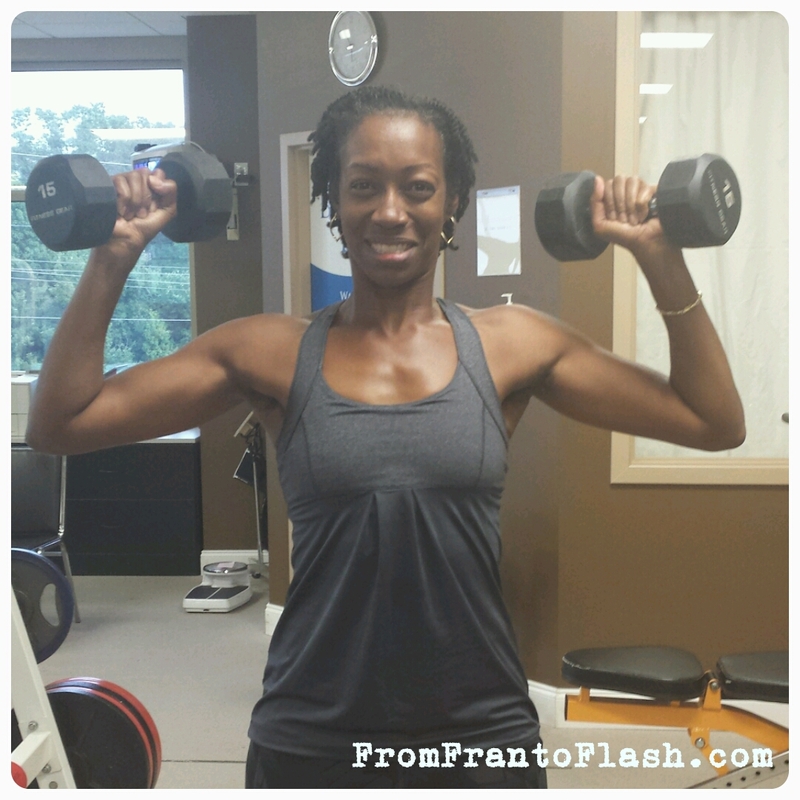 I am starting slow with the running and low with the weights. I do not want any setbacks. In 4 weeks I can start my long runs again and I will be back on track with my marathon plan. After my marathon, my trainer and I have plans. I am looking forward to putting them into action. Watch out! I am on the road to recovery and I will only get stronger from here. Thank you all for the emails, texts, calls and prayers wishing me well. I appreciate each and every one of you. I am on the mend and you helped me get there. Have you had an injury or setback? How did you handle it? Fit, Fab and 40! Happy Birthday to Me!! I turn 40 today and I feel fabulous! I am the fittest I have ever been. I am exercising regularly, eating clean and living healthy lifestyle. I have become more committed to my fitness and my health. 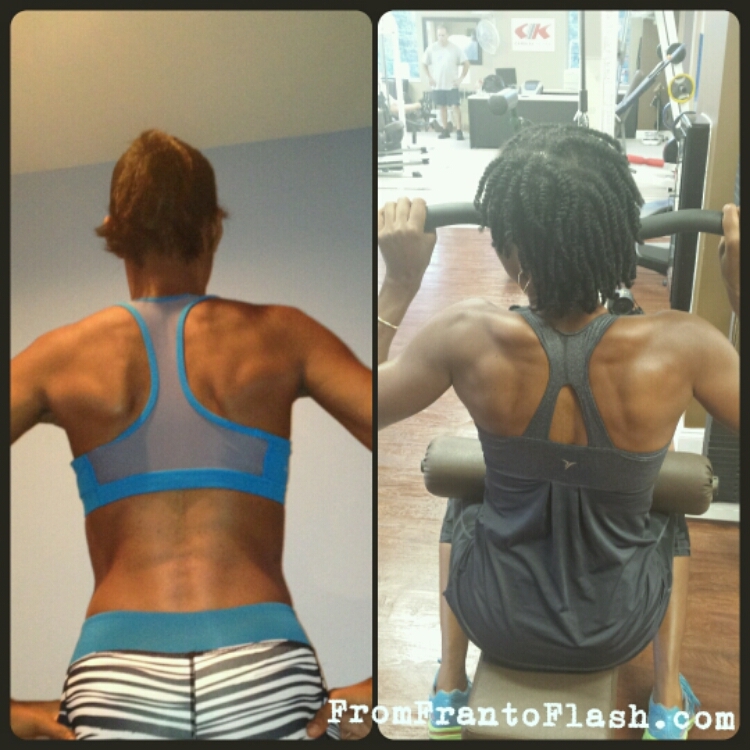 By hiring a personal trainer, I have been able to gain weight and muscle the proper way. My body is changing and so are my workouts. I am becoming stronger and leaner while putting on weight. I am seeing the results of my hard work and it is making me want more. I am eating cleaner and it has helped tremendously with my fitness as well as my stomach issues. That is a win-win for me. I have become a little more adventurous with the foods that I have been eating. I am fueling my body and it is paying off! My hard work is paying off, my body is changing and I feel amazing! I asked myself why I was not as committed to fitness in my 20’s and 30’s as I am today and the answer is…TIME! In my 20’s I had my kids and was committed to raising them. I am ready now. I am committed to being a better, stronger, healthier, happier me. I am proud of who I am becoming and what I am accomplishing thus far. I have set several goals, put a plan in motion and there is no stopping me! I am not ready to reveal what they are right now. As I accomplish my goals, I will write about each and every one of them. I am getting stronger, healthier and happier!! Strong mind, stronger body! I am in this 100% and I am getting better with age! How do you feel you are aging? Are you getting better? Stronger? Happier? Healthier? I would love to chat with ya! Fridays are my rest day. I strength train Monday thru Thursday, rest Friday and run long on the weekends. It is a day that I rest my body and mind. 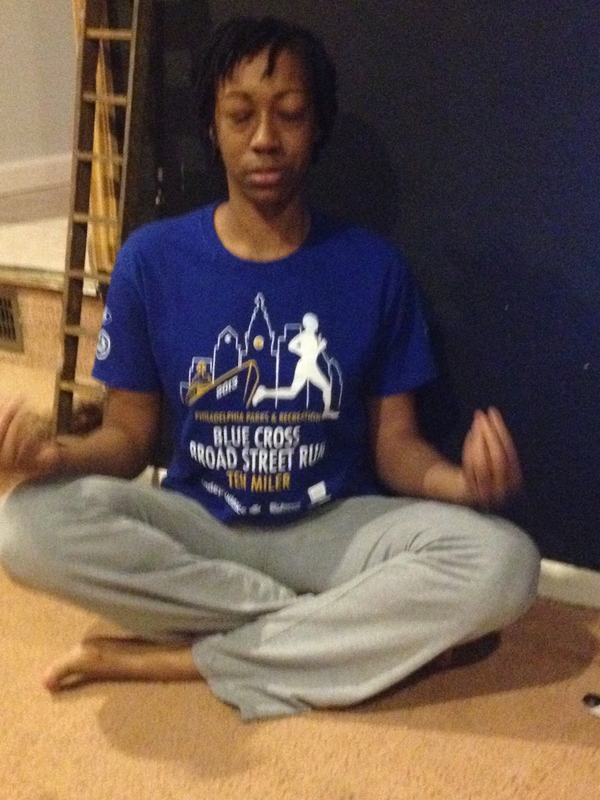 I practice breathing techniques, meditate, stretch and read. I read whatever both fiction and nonfiction. I am going to add yoga to this routine as well. Initially I thought of my rest days as resting only my body. It definitely needs rest but my mind does too. I need to release myself of the weekly stresses and worries. Let my mind wander off to a quiet place and recharge itself. A recharged body and a recharged mind are what I need to keep my sanity. Once I reach this place I feel calm and relaxed. I feel an inner peace and like I am able to function properly. I like getting a good book and reading. I do not always read about exercise and health. 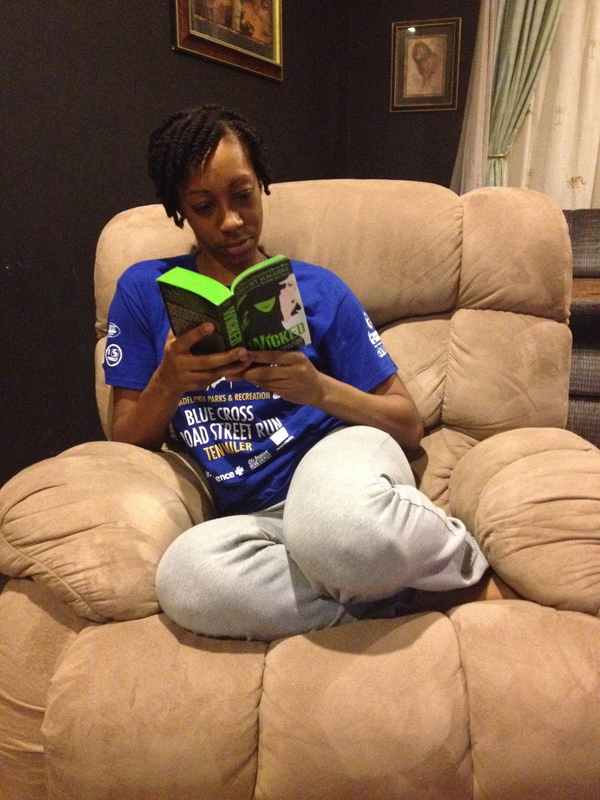 Right now, I am reading Wicked because I loved the play so much. It takes me back to the play and a place of contentment. I love my rest days and they help me recuperate and recharge for the coming week. Working out takes a lot out of me mentally and physically and a rest day helps restore all that I have given during the week. What do you do on your rest days? Hi everyone! I have made it though January injury free! Woo hoo! I have also been consistent with my workouts and clean eating. My plan for February is to continue to do the same with minor tweaks here and there. I am committed to being a happier and healthier me. I want to continue working out 4 days a week, continue training for my 10 miler and half marathon races and remain positive. I am seeing progress and love the confidence I am gaining from it. I am going to go by the old saying, “If it ain’t broke, don’t fix it.” I have a foundation and I am going to continue to build upon it. I am getting stronger, faster, happier, and more confident while staying positive. Looking forward to a Fantastic February! What are you looking forward to in February? Are you making any changes? 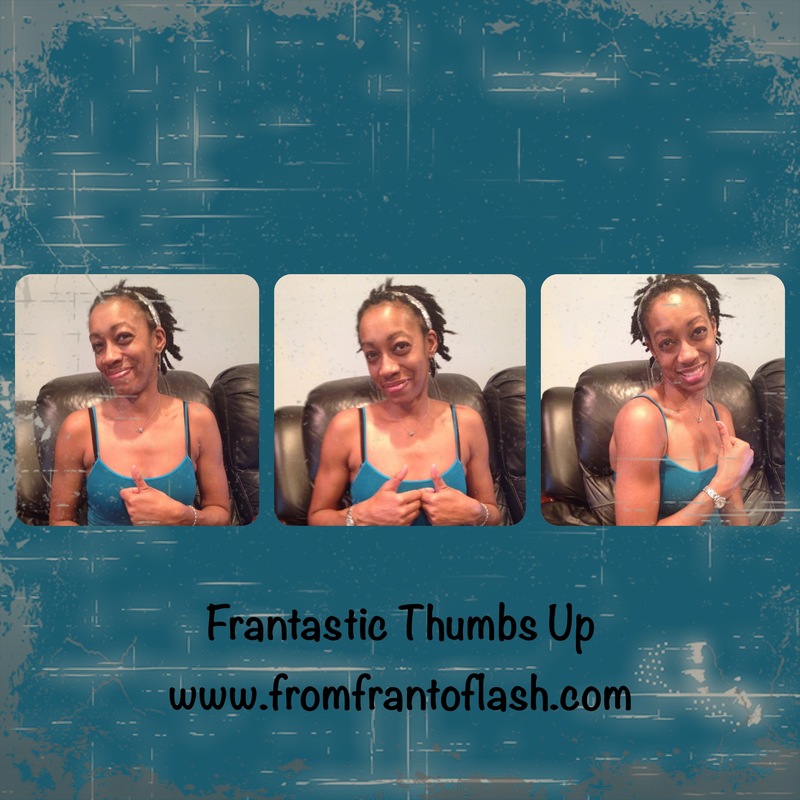 Whatever you are doing, make it FRANtastic!